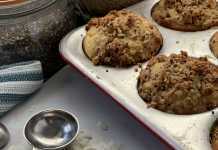 These overnight French toast muffins are the perfect breakfast for Christmas morning. They are French toast, bread pudding, and muffins all in one! Plus, as the name overnight French toast muffins implies, much of the work is done the night before, leaving very little to do the morning of. This recipe calls for a pomegranate syrup on top, but if you want to cut down on prep you can just use a classic maple syrup. You can also substitute with a blueberry or strawberry compote or even use one of our delicious cranberry sauces, like our blueberry cranberry sauce for something super festive. Cut 1/3 a loaf of bread into one-inch cubes. 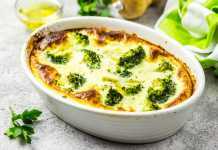 In a medium mixing bowl, whisk together the milk, egg, cinnamon, nutmeg, and brown sugar together, then fold the bread into the milk-egg mixture. Let sit overnight in the fridge. Spoon soaked bread into muffin tins and bake in the oven for 10 minutes. In a small sauce pan, combine pomegranate, sugar, and ½ cup water. Heat until pomegranate seeds begin to break down, giving the syrup a deep red color and thickens to a syrup consistency. Serve French toast muffins with pomegranate sauce.